In a time where demands of cheap and avaible meat far exceeds what the local butcher could put out, slaughterhouses have become the only option. 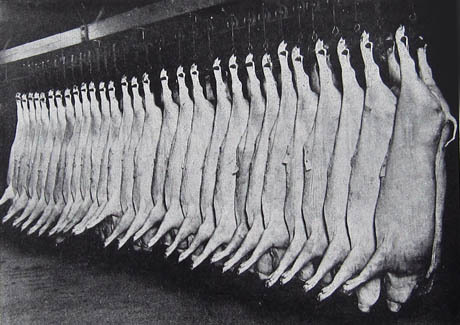 Eating meat is a part of daily life, and people barely wonder where it came from before it was sold off on the shelter of supermarkets with their nicely wrapped packages. It wasn’t until 1906, when the novel “The Jungle” was published that people began to question and become aware of what actually happens behind the scenes. Due to the public outcray cause by the book, the government immediately took action and form the Food and Drug Administration also known as the FDA. This entry was posted in February 28 Assignment and tagged assembly line, FDA, The Jungle, unsanitary slaughterhouses. Bookmark the permalink.